Are Your Creative Dreams AT STAKE? What if a few simple questions could alter the whole course of your creative life? What if a few simple questions created in you a greater sense of urgency, clarity and focus for the creative dreams you have in your heart? Do you live with a strong sense of CREATIVE FLOW when you create? What if you only had six months to live? What creative dream would you pursue if you knew that you only had a short amount of time left on this earth? In The 7 Simple Questions You Must Ask to Achieve Your Creative Dreams, I designed a simple, practical and very affordable online course to help you see your dreams realized. I'd love to personally walk you through The 7 Simple Questions with inspiring stories, helpful ideas, new resources, and strategic action steps. In Lesson 2, I explore the critical concept of CREATIVE FLOW, how it works and how it can make a tremendous difference in your life! 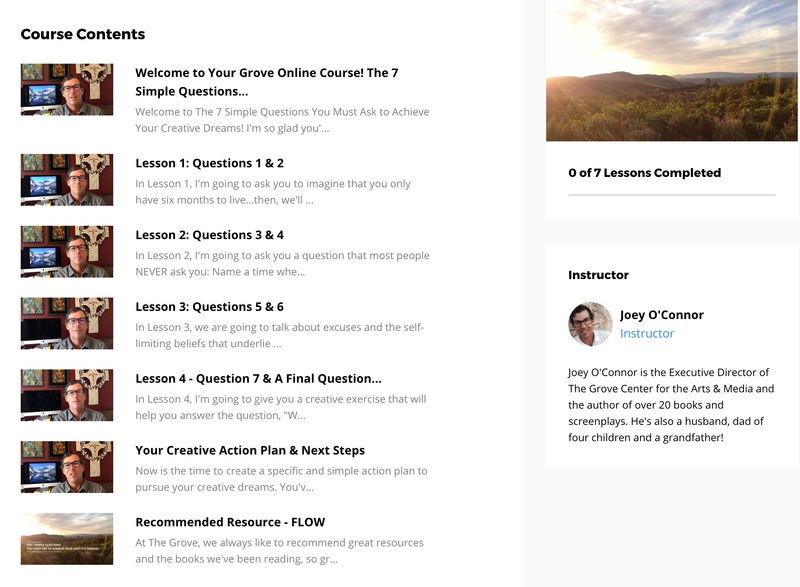 This Grove Online Course offers you great value and benefit by helping you achieve the creative dreams you're passionate about fulfilling in your life. When did you first discover you had CREATIVE gifts, talents and dreams? When have you felt incredibly ALIVE in creating your art? How does FEAR hold you back from achieving your creative dreams? Do you allow EXCUSES to keep you from achieving your creative dreams? What is AT STAKE by YOU NOT achieving your creative dreams? And that's just a start...inside the course, I actually ask a whole lot more questions to get you thinking, planning, and creating a specific action plan to put your dreams to work. Don't delay . . . your dreams are waiting to be fulfilled. You have much beauty to offer this world with your creative gifts. I'll see you inside the course. If you are not 100% satisfied, we will give you a full refund! The Grove Center for the Arts & Media is a Southern California arts organization. Our mission is cultivating the spiritual life and creative work of artists. Are you achieving the creative dreams you have in your heart? Are you motivated in your creative life? Do you see movement and momentum in what you're creating? In The 7 Simple Questions You Must Ask to Achieve Your Creative Dreams, Joey O'Connor will lead you through 7 simple questions designed to bring greater urgency, clarity and focus for pursuing your creative dreams. Step into this Grove Online Course and see the tremendous difference it will make in your life today. Our 100% Grove Guarantee - If you're not completely satisfied, you will receive a full refund.